Profiteroles, a classic French dessert, can easily be prepared in advance and frozen, both before and after baking. Profiteroles are made with choux pastry, a type of pastelike dough cooked on the stovetop and baked into small, bite-size pastry rounds. The pastry is split in half and filled with ice cream, pastry cream or whipped cream, then traditionally drizzled with a chocolate sauce. Freezing the prepared, but unbaked, dough ahead of time makes assembling fresh profiteroles fast and easy. However, you can also freeze assembled profiteroles filled with ice cream, thawing them just before serving. Pour the prepared choux pastry dough into a pastry bag with a fitted tip. If you don't have a pastry bag, you can put it in a large resealable freezer bag and snip off the tip of one corner of the bag. Pipe out equal-sized mounds of dough, roughly 1 to 2 inches in size, onto a baking sheet lined with parchment paper. Space them out so they are at least 2 inches apart. Tap down the peaks on each mound of dough, which form from piping, to prevent them from burning before the rest of the profiterole bakes. Place the sheet of profiterole dough in the freezer and allow them to freeze completely. Remove them from the baking sheet and store in an airtight container in layers, with a sheet of freezer paper or parchment paper between each layer, until you are ready to bake the dough. You can freeze them for up to 2 months, but they are best when baked as close to fresh as possible. Split baked and cooled profiterole pastries in half and fill with a scoop of ice cream, pastry cream or stabilized whipped cream. Work quickly when working with ice cream to keep it from melting. Place the assembled profiteroles on a baking sheet and place in the freezer until pastry and filling are frozen solid. Wrap each frozen profiterole carefully in plastic wrap and return to the freezer, storing them in a large, airtight container. When you are ready to serve them, let them sit at room temperature for about 5 to 10 minutes before serving and drizzle with a warm chocolate sauce. 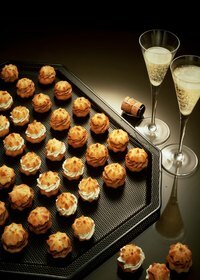 Serve assembled and frozen profiteroles within 3 to 5 days to enjoy them at their best. To bake the frozen profiterole dough, place them on a lined baking sheet and bake in an oven preheated to 400 degrees Fahrenheit for about 10 to 12 minutes, or until the pastry is puffed up, golden brown and firm. Cool on a wire rack. Split the pastries and fill them with pastry cream, stabilized whipped cream or a scoop of ice cream, then drizzle with chocolate sauce, or give them a dusting of powdered sugar. When cooling the profiterole pastry, split them while still warm to allow the centers to cool and dry out, rather than getting soggy. Always use stabilized whipped cream, especially when freezing, so that it will hold its shape. You can purchase store-bought stabilizers and follow their instructions, or you can add 1 tablespoon of cornstarch to every 1 cup of cream, after reaching the soft peak stage of making whipped cream. Continue whipping until stiff peaks form.